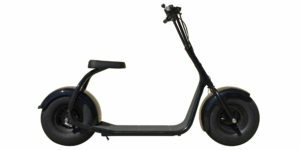 Works Electric is an American company based in Portland, Oregon, that focuses on high-end, powersport electric scooters. The owner, Brad Baker, hand makes each vehicle with American-made parts, putting his skills as a mechanical engineer, machinist and master TIG welder to good use. 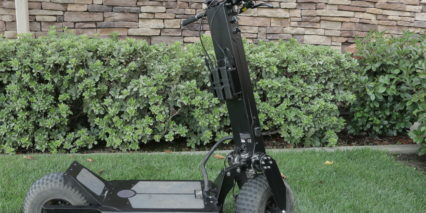 There are three different versions of Works Electric’s scooters, which are called Rovers: The BR2, Hollyburn P3 and Hollyburn P5, which boasts a ridiculously powerful 4,400 watt ZM2-R electric hub motor that drives the machine to a top speed of 37 mph and a Lithium-ion battery pack that offers a max range of 28 miles. But, perhaps even more impressive is the Hollyburn P5’s overall design. 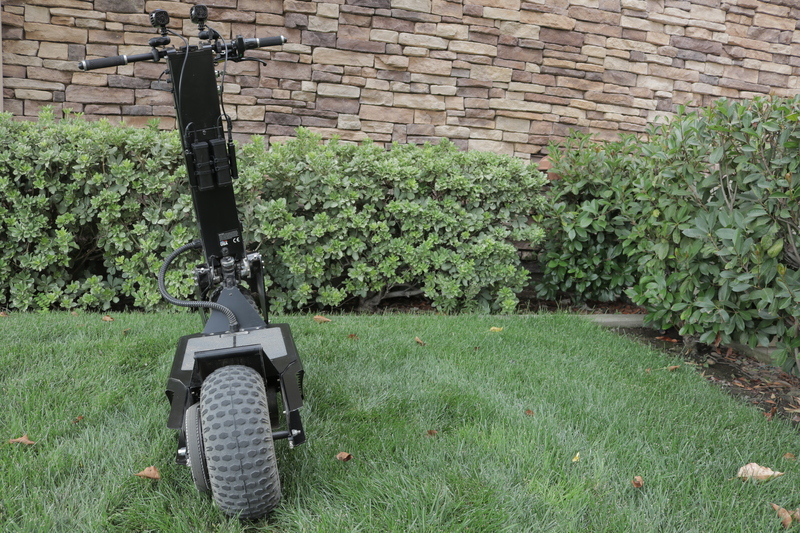 The Crusher Five-Point chassis armor gives the Hollyburn P5 full protection from rocks and debris, meaning this electric vehicle can power through off-road trails just as well as it can carve up the pavement. 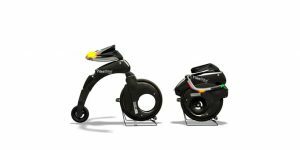 And, when you’re ordering the bike, they offer slicks or knobby tires and can customize the top speed if you prefer to go a little slower. With IP66 weatherproofing, neither rain nor snow will keep you from riding. I’ve put nearly a 1,000 miles on my Hollyburn P5 and have tortured the machine to the point of absurdity — I’ve torn through backwoods trails, jumped over berms, rammed into rocks and even wrecked a handful of times — with no ill effect other than a few “racing stripes.” But even when tackling the most technical terrain, the Hollyburn P5 offers a surprisingly comfortable ride thanks to its extra-wide 15-inch deck and massive 14-inch pneumatic tires. Kicking up dirt is a blast, but taking to the streets is just as exhilarating — I absolutely love cruising next to cars at nearly 40 mph and seeing baffled faces staring back at me. Hill climbs are a breeze too. I weigh 200 pounds and always carry about 20 pounds of camera gear with me, but even with all that weight the Hollyburn P5 effortlessly flies up hills and only bogs down at the steepest of inclines. I’ve been using the knobby tires, which are great for off-road but are a little noisy on the streets (I haven’t used the street tires, but I suspect they’re much quieter), and after almost 1,000 miles the rear tire is close to needing replacement (which will cost ~$39). 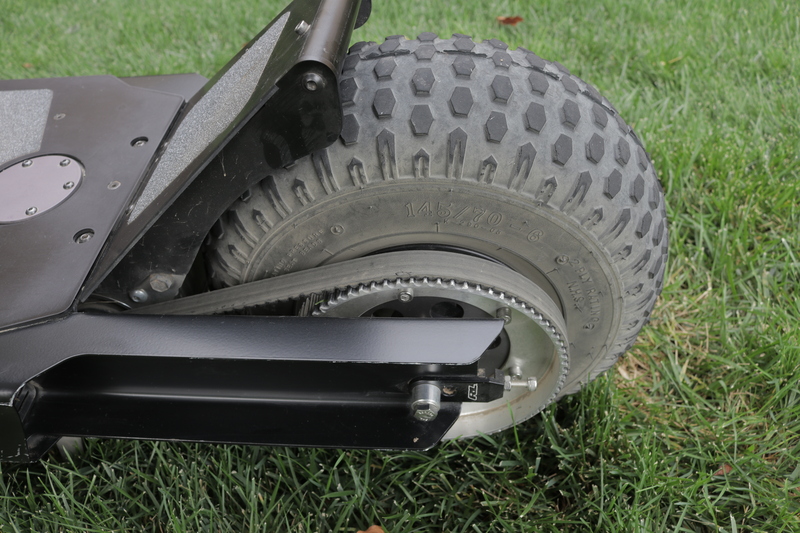 However, aside from normal tire wear everything is still in perfect working order. 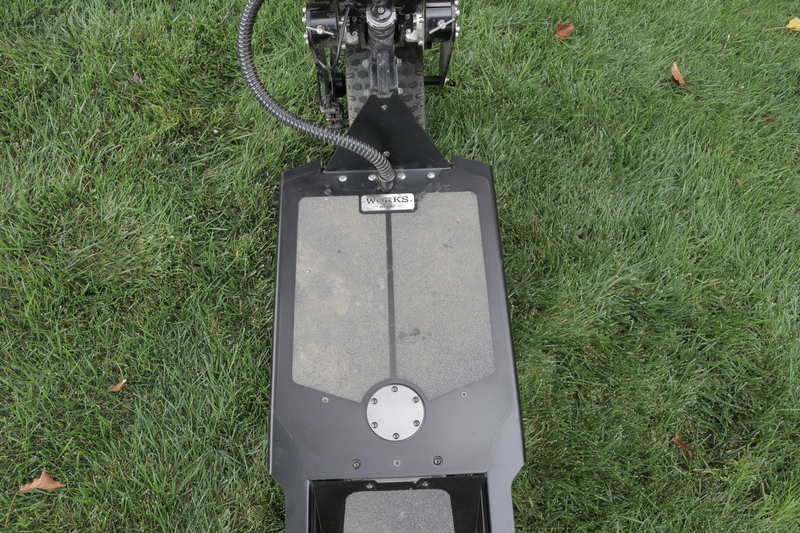 The Hollyburn P5 comes in two colors — black and burnt orange — and is constructed from aircraft-grade aluminum with stainless-steel structural inlays in high-load locations, giving the machine a curb weight of 86 pounds and a carrying capacity of 280 pounds. 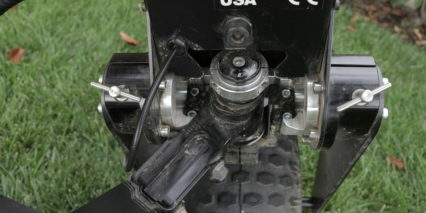 I’ve been rocking the belt drive, but a chain drive option exists as well for riders who really want to push this machine to its limits. 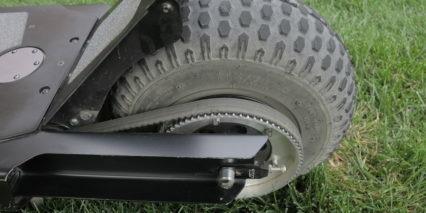 The belt drive is pretty much hassle-free and made with Kevlar reinforcement for strenght, it’s clean and quiet compared to the chain. 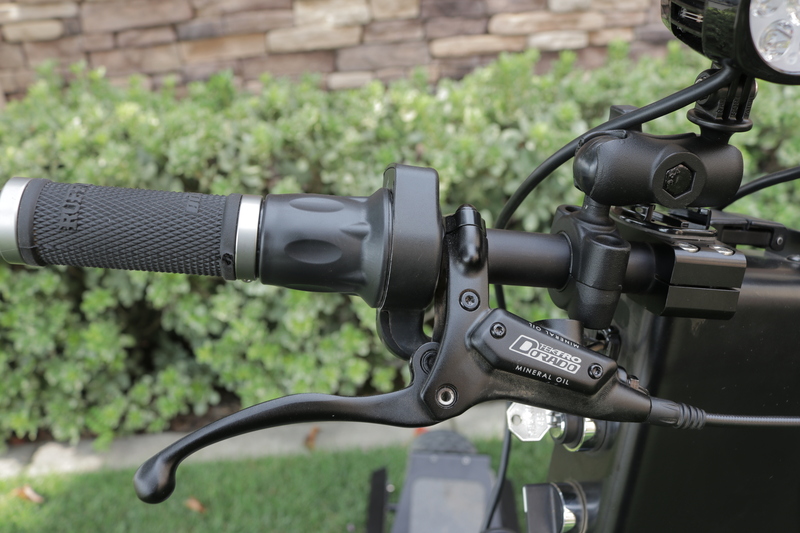 On the right grip is a twist throttle that unleashes 4,400 watts of power on command and a brake lever that activates the regenerative braking upon light press; heavy depression activates the front 180 mm disc brake. 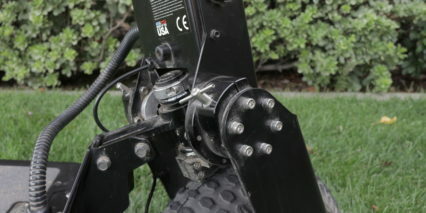 The regenerative braking is unexpectedly strong and can be used as the primary braking mechanism in all but the most extreme braking situations. But the trade-off here is, it can sometimes feel like gentle braking isn’t as much of an option, braking is not as progressive at the low end. 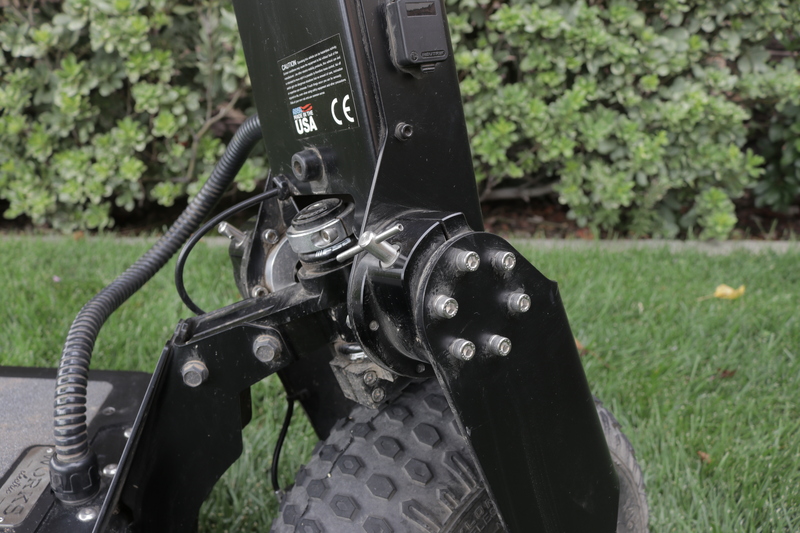 On the stem, which is crafted from cold-rolled steel for maximum durability, is the key ignition and knob to toggle the front and rear LED running lights. 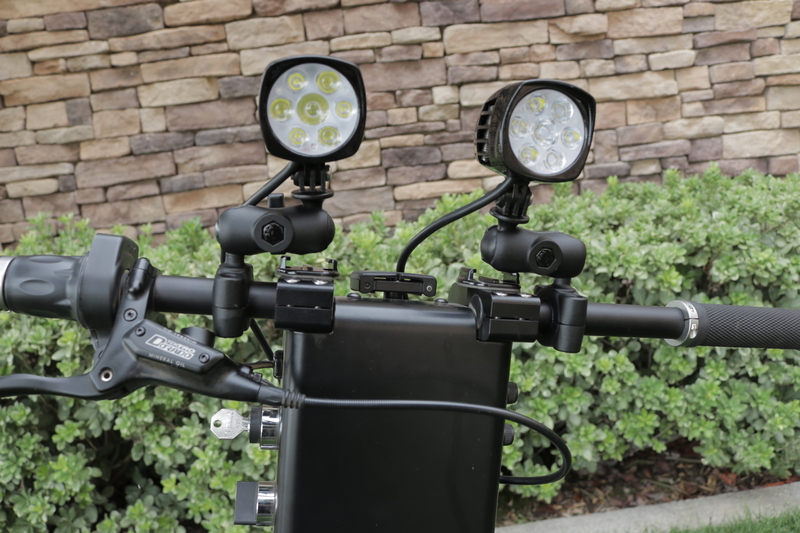 These light lights are really cool, and look sturdy, but I didn’t feel that they offered enough brightness to fully illuminate my rides… so I mounted some additional lights on the handlebar. 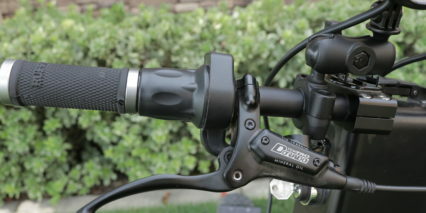 At the bottom of the stem is the chunky headset assembly, where two pairs of screws and pins keep the downtube locked in place during even the most aggressive off-road adventures. 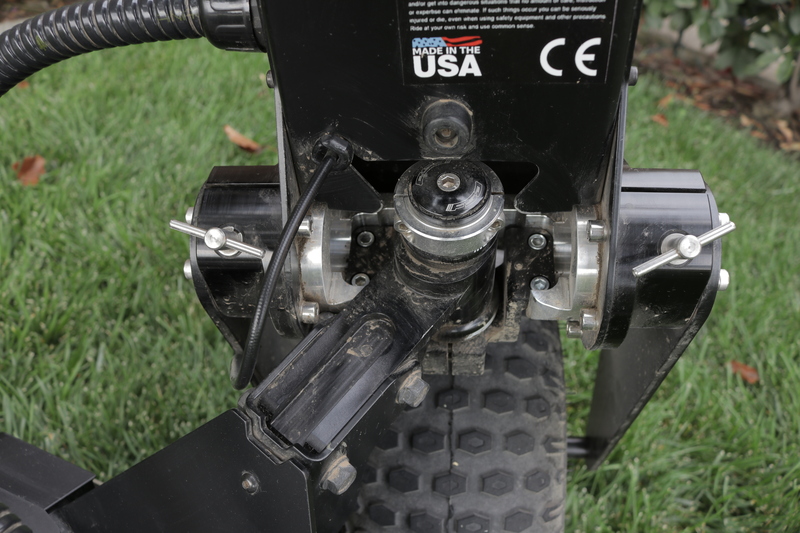 Towards the rear of the deck rests the fastening point for a seat post and at the very back there’s a spot to attach a pannier rack for those particularly long rides where you need extra storage. Driving the Hollyburn P5 these past couple of months has been nothing short of a blast. 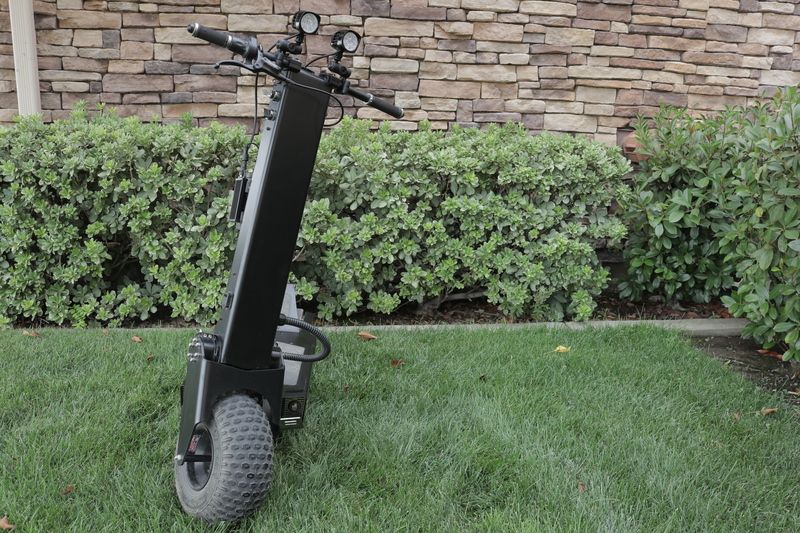 I’ve been using this machine as my primary mode of transportation for any trip within a 15-mile radius of me, and have made it a point to search out any and every trail that connects to the main streets. After all, if you’re not having fun, what’s the point of owning one of these? You’re certainly paying for it. 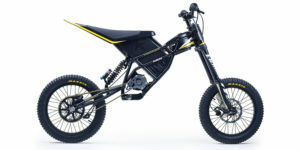 The riding style for the Hollyburn P5 reminds me a lot of dirt bikes, except with far less handlebar movement. 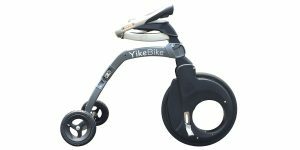 It’s much more of a whole-body experience as opposed to just torquing on the handlebars to change direction – you really have to lean into turns, like on a snowboard or skateboard. Even after nearly 1,000 miles, the acceleration still sometimes shocks me when I twist the throttle. 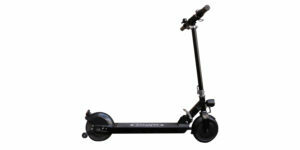 Note, full acceleration from stop will probably drain the battery faster and since the throttle is hot once the scooter is turned on, you want to be careful not to bump it accidentally because it will take off and at ~86 lbs, it’s a substantial scooter. 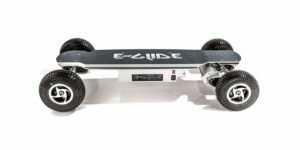 The machine picks up speed with a quickness and hits 37 mph much faster than I expected. One of my favorite things about the Hollyburn P5 though isn’t the speed (though that is a pretty epic feature) but how powerfully it brakes. 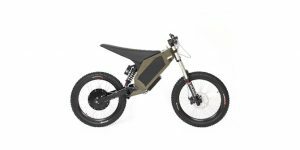 The massive front disc brake gives me the confidence to actually utilize all of the Hollyburn P5’s power, whereas I’m far more cautious with some other electric vehicles that only have regenerative braking. All in all I’m still impressed with this vehicle every time I hop on it, honestly I love this thing! 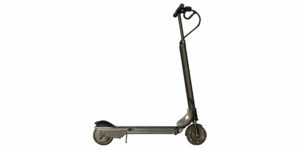 It’s fun, quick and practical and I ride it pretty much at least once a day. 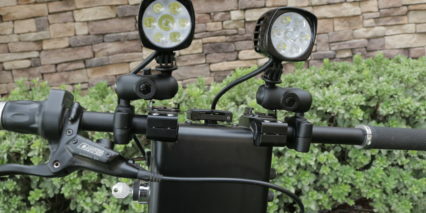 There’s not much I’d change about the Hollyburn P5, though I would like to see a few additional features in the next model – a powerful, integrated headlight that actually illuminates your path; a brake signal; turn signals and a heads-up display that shows current speed, an odometer and a tripomoter. 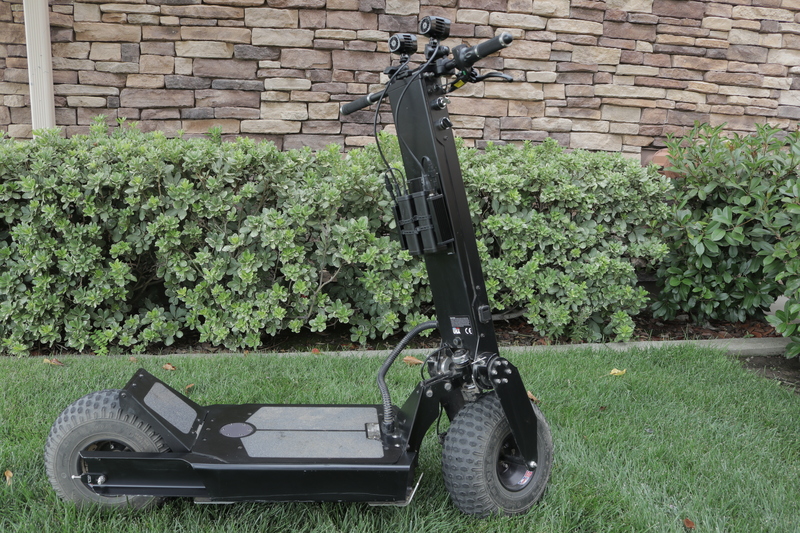 I feel like this is a great vehicle for anyone who is looking for a serious alternative to driving, or just wants to have fun tearing up some trails… but it is technically an “off road vehicle” depending on where you live. That may put some restrictions on where restrictions on where you can ride. Another consideration here is that if you do get some racing stripe scratches, the steel portions of the scooter may rust a bit over time. 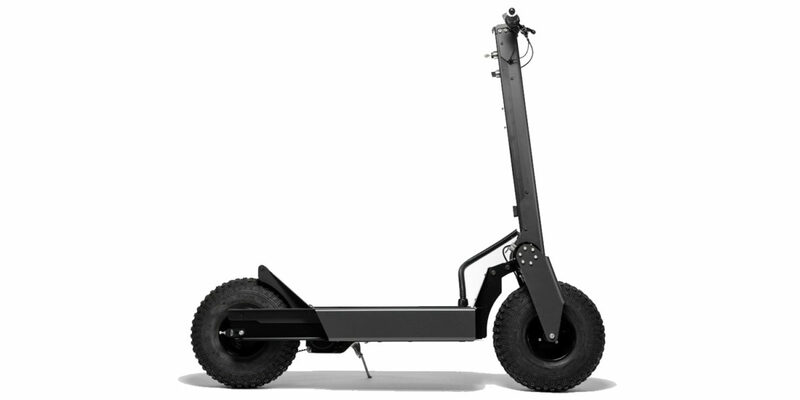 I think the Hollyburn P5 is really the only electric scooter of its kind, and if you’re looking for the fastest, most powerful, standup electric vehicle to get you around, this is definitely it. This thing would be a blast at Burning Man! 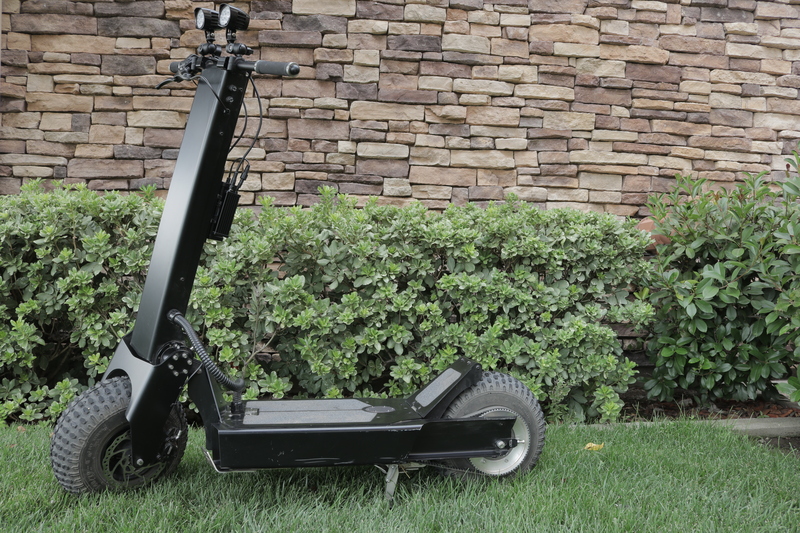 Last thing I’ll say is if you have can, grab the fast charger – Works Electric says it takes about two and a half hours to charge, but it actually charges close to full capacity in one and a half hours. 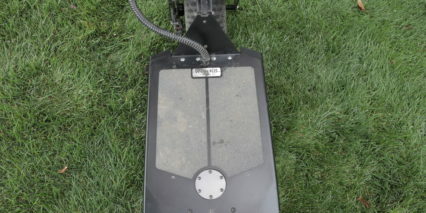 I’d like to thank Works Electric for partnering with me on this review and providing a demo unit.